We've had a "round robin" swap on UKStampers over the last few months - we each chose a stamp and sent it to the next person in our group and then after two weeks we passed on the stamp we'd received and so on until our own stamps came home. We had no limitations on what we made and could do whatever we liked with our projects. I decided to make postcards with the stamps I received and I'm sending the cards to the people who own the stamp used to make it. The cards are all ones that can be posted as genuine postcards (no envelope) and standard postcard size (6x4"). I'm blogging just a couple here. 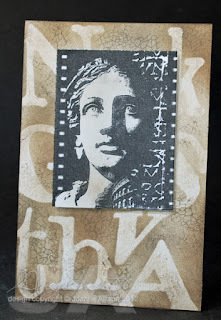 Pat sent us this Roman statue stamp to play with. One of the beauties of this kind of swap is that you get to play with stamps you wouldn't normally choose and this fell into that category for me! I started thinking about grafitti because of the lettering down the side of the image. I stamped the image, masked it and then added some random lettering masks and sponged with neutral inks. I added a crackle stamp over the top, using only part of the stamp and moving it around randomly to get patches of crackle effect. I used markers to add a drop shadow to the image to give an illusion of some depth. Witchy chose this photo-realistic image of Elvis to send out (I recognise it as a Stampsmith stamp). I happened to have an Elvis set in my own collection so I used a couple of those faces as part of the background by stamping in the same colour as the sheet music stamp I used. I did the wording by printing out (mirror image) onto an acetate sheet and then rubbing over it with a lolly stick to transfer it to the postcard - I like the slightly grungy look it gives and you don't have to fret about lining up a postcard to go through your printer! Clever cards, Joanne. I particularly like the Elvis one. Great postcards... I really liked this swap. I admired these on the forum, Joanne (and your others). 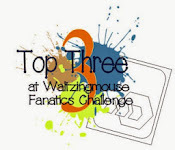 I wish I had participated now but at the time my mojo had gone AWOL. 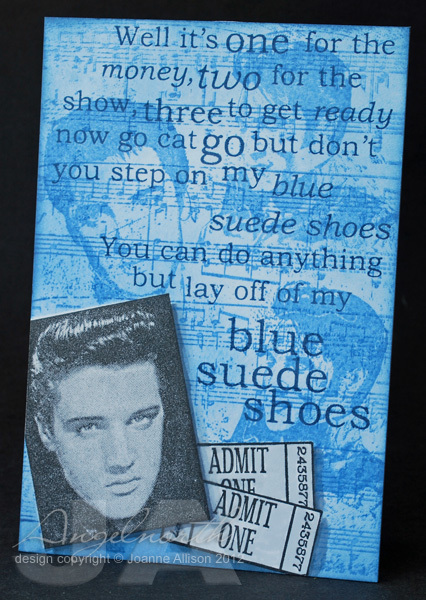 I really like the Elvis postcard. I don't have that stamp set but by seeing these amazing postcards I am going to go out to my craft room from http://roomstogrowusa.web12.hubspot.com/hobbyrooom/ and play around until I can make a decent postcards. Mine will not compare to yours! Oh my! The Elvis creation is fabulous, Joanne. Love the blue and collage. What super postcards you've created, love all your masking effects - so clever.